TOLD Development broke ground in 2004 on the initial development of this master-planned retail center located on over 110 acres of prime I-39 freeway property. The first phase of the project encompassed over 500,000 square feet of retail space anchored by Kohl’s Department Stores, Lowe’s Home Improvement Center and a Wal-Mart Supercenter. Additional users include Best Buy, Michaels, PETCO, MC Sports, McDonalds, Starbucks, US Cellular, CitiFinancial, Hudson’s Classic Grill, Charcoal Grill, Golden Corral, and M&I Bank. TOLD is offering users a mix of multi-tenant mid-box and small-shop developments as well as for-sale and ground-lease outlot opportunities within the center. Crossroads Commons will offer a wide range of complementary goods and services ranging from dining and entertainment to consumer services. TOLD worked very closely with the Village of Plover on the design and implementation of the extensive public infrastructure improvements necessary to service the development and the surrounding area. The Village, partially through a special assessment district, installed the necessary utilities and internal roads for the site. 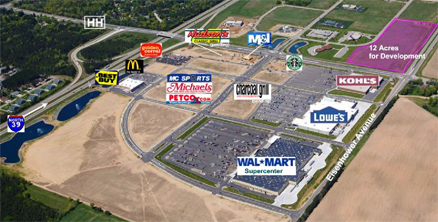 With its combination of size and visibility, Crossroads Commons has become the dominant regional retail destination in Central Wisconsin.